Anne Johnston was selected as the Chief of Police for Stockton Unified School District Police Department In July of 2017. 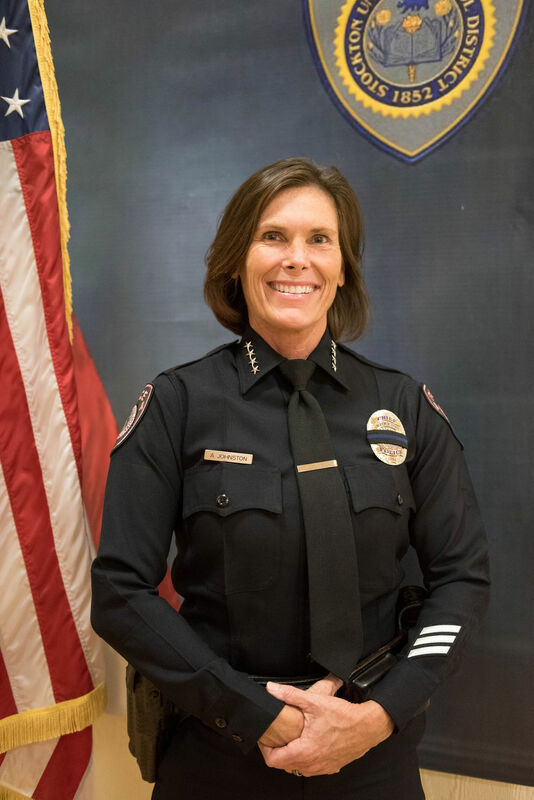 She began her law enforcement career in 1991, serving as a juvenile probation counselor in Southern California prior to her appointment with the California Highway Patrol where she worked as an officer and sergeant in various assignments from 1995-2005. Chief Johnston subsequently worked as a business owner, then Law Enforcement Consultant and Bureau Chief for the California Department of Justice, Commission on Peace Officer Standards and Training (POST) until 2014. She was privileged to have been chosen to serve in the position of Captain for Stockton Unified School District Police Department from 2014-2017. 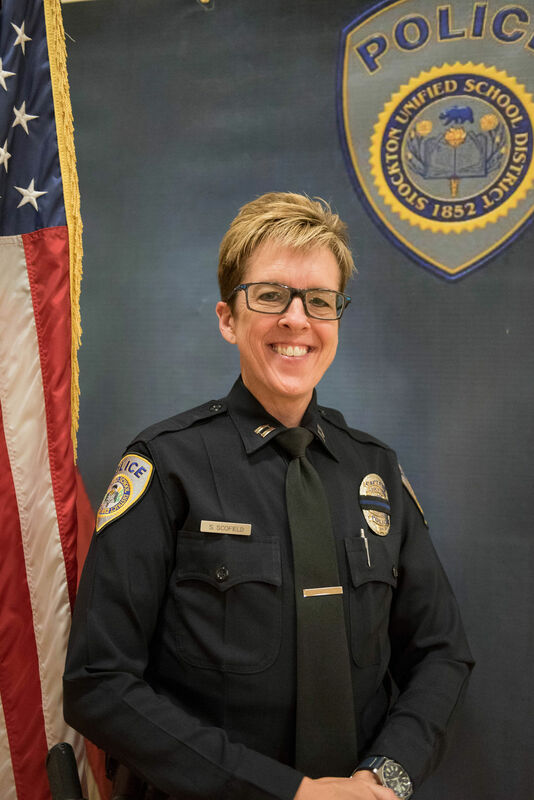 Chief Johnston obtained her Bachelor of Arts Degree in Psychology from California State University at Fullerton and expects to attain her Master of Science Degree in Criminal Justice in early 2018. Captain Scofield brings over 14 years of sworn law enforcement experience as both a deputy sheriff with the Orange County Sheriff's Office and police officer and sergeant with Pleasanton Police Department. Highlights of her duties include working as a K9 Handler, Field Training Officer and FTO Sergeant, Administrative Sergeant as well as a juvenile detective. 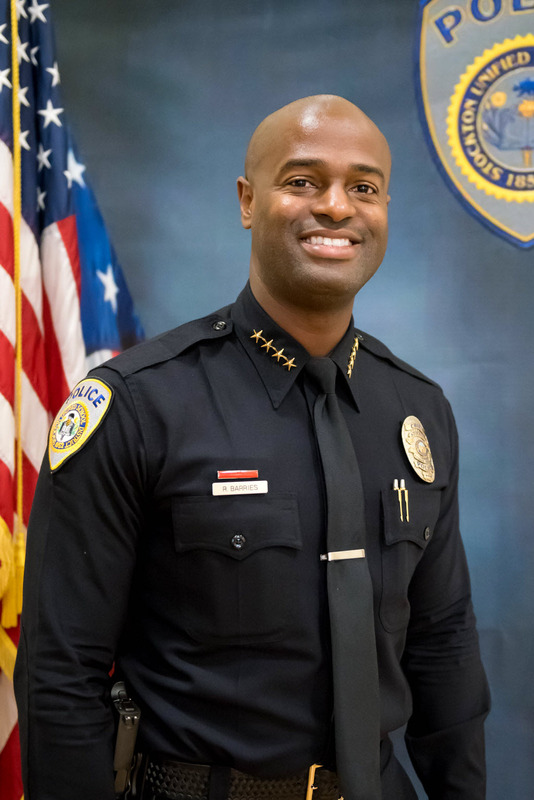 Most recently, Captain Scofield served as both the Interim Executive Director and Assistant Executive Director for the California Commission on Peace Officer Standards and Training. She also holds a Bachelor of Arts degree in Criminal Justice. 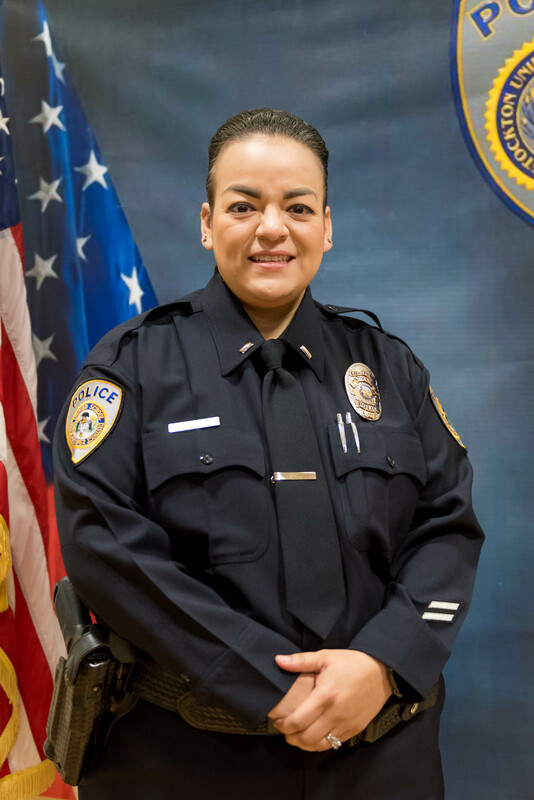 Lt. Mayra Franco joined the Stockton Unified School District Police Department in 2007 and has served as a Patrol Officer, a School Resource Officer, and a Field Training Officer. She was promoted to the rank of sergeant in June 2015, overseeing patrol functions. Lt. Franco is a Stockton native and a Stockton Unified Schools graduate. She has her Associate's degree in liberal arts from San Joaquin Delta College and her Bachelor's degree in Criminal Justice from California State University Stanislaus. Lt. Franco has recently completed her Juris Doctorate from Humphreys College and has been admitted to the BAR and can practice Law in California. Lieutenant Richard Barries became a member of the Stockton Unified School District Police Department in 2018. 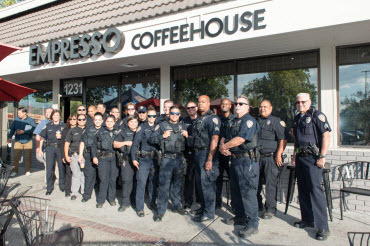 Lieutenant Barries previously worked for the Santa Clara County Sheriff’s Office, East Palo Alto Police Department, and Stanford University Department of Public Safety. 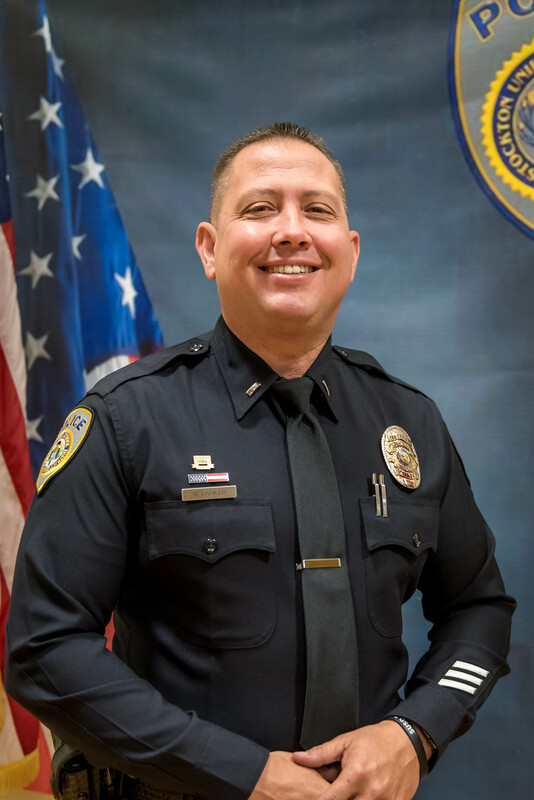 Lieutenant Barries has an Associate of Arts Degree in Liberal Arts from De Anza College, a Bachelor of Science Degree in Justice Studies from San Jose State University, and a Master of Arts Degree in Criminal Justice and Graduate Certificate in Law Enforcement Administration from Arizona State University. Sgt. Marquez graduated from Edison High School in 1989. 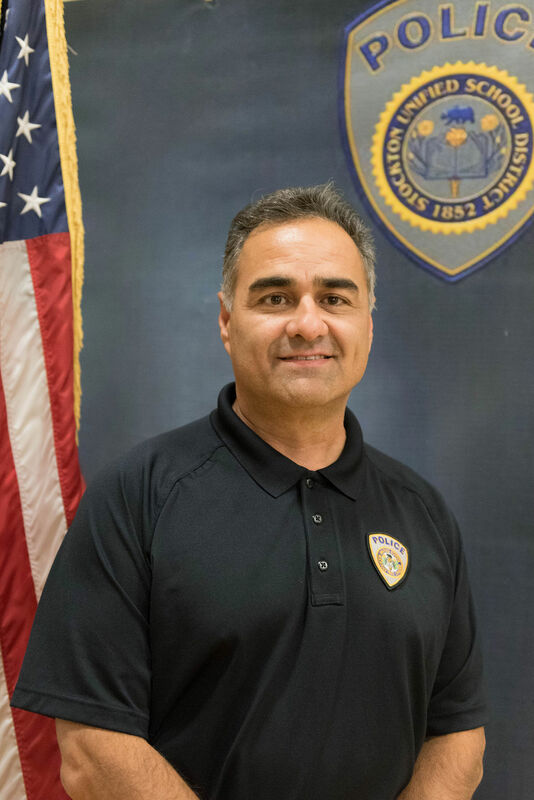 He went to San Joaquin Delta College and graduated with an AA Degree in 1993, then attended the San Joaquin Delta College POST Academy class of 1993. He was hired at the Alameda County Sheriff’s Office in 1994 and stayed there until 2002. He worked at Santa Rita Jail, Eden Township Substation Patrol, Alameda County Narcotics Task Force, and the Oakland International Airport as a Deputy Sheriff/ Detective. Then hired by SUSD Police as a Reserve in August of 2002, then eventually a full time Officer in November of 2002. 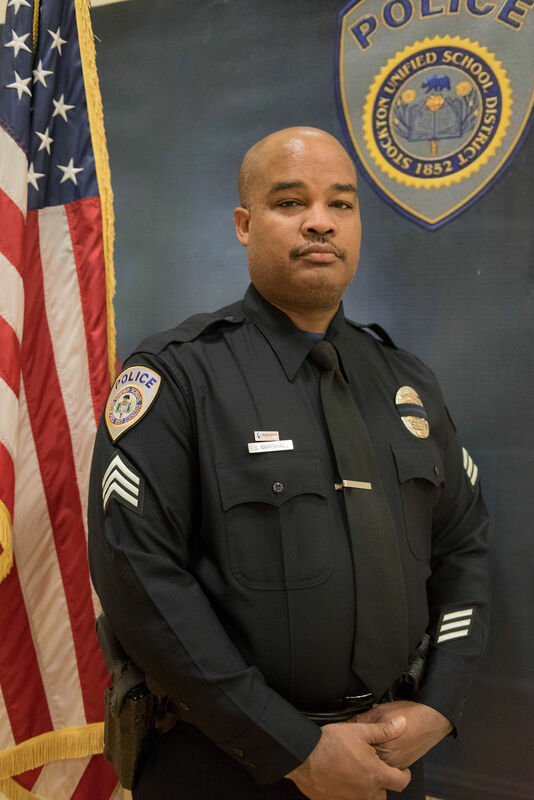 He Worked as an School Resource Officer at Stagg High, Edison High, and Weston Ranch High. He coached Edison High School Baseball, Head Varsity Baseball coach from 2005-2009, again Head Coach in 2015 and took them to the Playoffs. He was promoted to Corporal July of 2015, and worked as the Department Detective, then took over as Dispatch/Records Supervisor. He was promoted to Sergeant in July of 2018, currently Dispatch/Records Supervisor. Sgt. Rob Young graduated from the San Joaquin Delta College Police Academy in September of 2003. 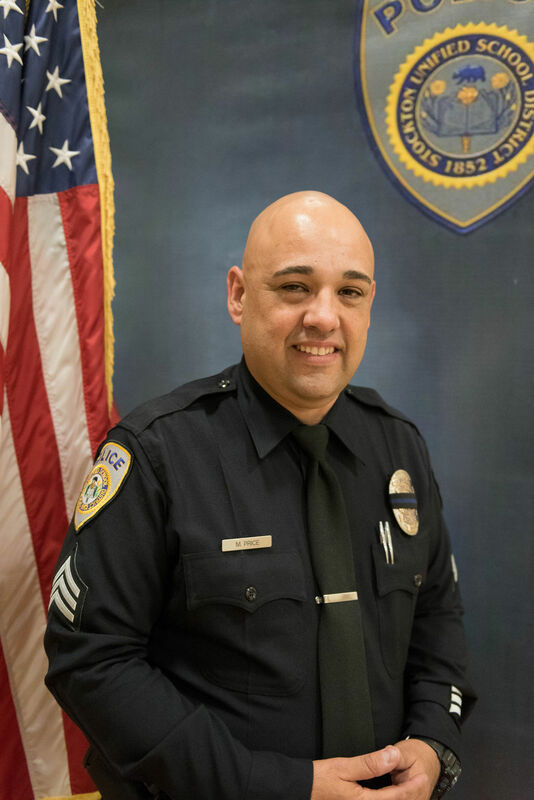 He was originally hired with the Stockton Unified School District Police Department as a police officer in early 2004, at which time he was assigned to patrol, and as a School Resource Officer at Edison High School. Sgt. Young was then hired as a police officer with the Union City Police Department in June of 2007. 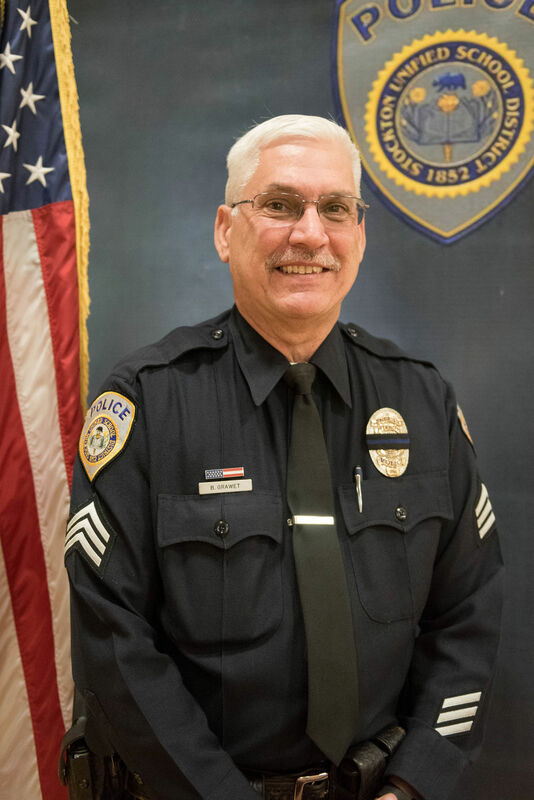 During his time at UCPD, he was assigned to various patrol shifts, as a Hostage/Crisis negotiator (certified through DPREP, as well as the FBI), Crisis Intervention Officer, Crime Scene Investigator, School Resource Officer, Explorer Adviser, and as an Active Shooter Response Instructor for the department. Sgt. Young returned to the Stockton Unified School District Police Department as a Sergeant in May of 2016. Sgt. Young will be returning to college in the near future, and plans on completing degrees in Criminal Justice and Public Administration. Sgt. Young is a strong supporter for community policing, and enjoys positive engagement with the people of Stockton. Sgt. Young graduated from SUSD schools, and has been a life-long resident of Stockton. He has a son named Christian, and a daughter named Alissa, who is commonly referred to as "Allie." Sgt. Paul Tualla has over 20 + years of public safety experience. He has worked in Law Enforcement, Emergency Medical Services and the Fire Service. Most recently he was the Fire Chief of the French Camp McKinley Fire District/Mountain House CSD Fire Department and was a Level 1 Reserve Officer/Training Manager for the City of Escalon. Previously, Sgt. Tualla worked full time for Tuolumne County Sheriff's Office and Citrus Heights Police Department. 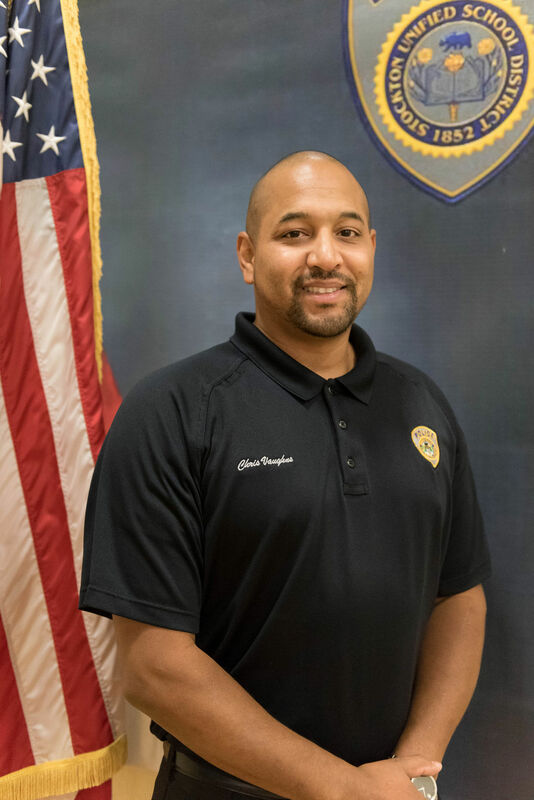 He worked various roles with those agencies including Patrol, Juvenile Detective, School Resource Officer, Training Manager, and Fire Investigator. Sgt. Tualla holds a BS degree in Fire Science, a Master's Degree in Business Administration, with a concentration in Public Administration, and is a graduate of University of Southern California's Delinquency Control Institute - Class #124. Sgt. Tualla is also a Certified Fire and Explosions Investigator (NAFI-CFEI) and is a licensed California Paramedic. Sgt. Grawet started with the Stockton Unified School District Police Department in 2004 as a reserve/substitute until being hired full time in January 2006. He has served as a School Resource Officer, Patrol Officer, and a Field Training Officer. Sgt. Grawet was promoted to Sergeant in June 2014. His duties include conducting Background and Internal Investigations, supervising the Investigations Unit and managing department training. Sgt. 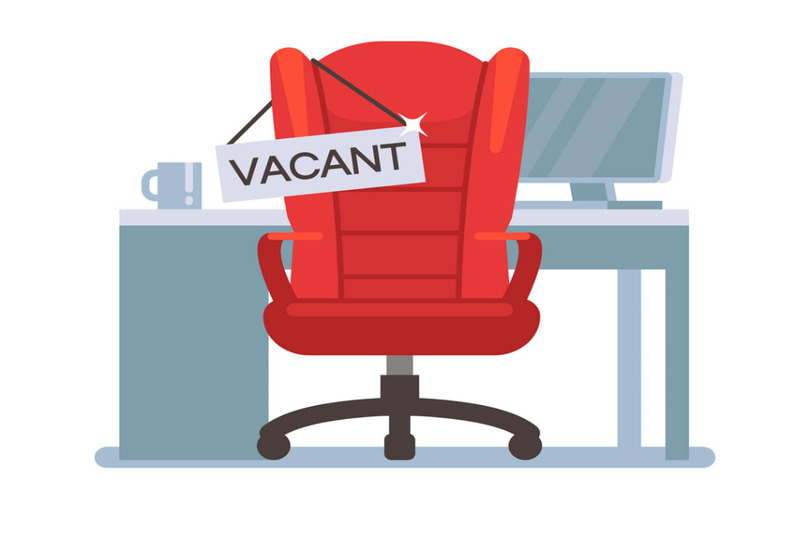 Grawet has a Bachelor's degree in the Management of Information Systems and is a certified Associate Project Manager. Sgt. Stephen D. Marshall has more than 15 years experience in law enforcement. He has served as a narcotics investigator, a field training officer, and an acting watch commander. He has taught fellow officers as a report writing instructor, TASER instructor, and as a defensive tactics instructor. Sgt. Marshall has worked for several agencies, including the El Cerrito, Union City, and Menlo Park Police Departments. He joined the Stockton Unified School District Police Department in March 2015 and promoted to sergeant in June 2015. Sgt. Marshall holds a BA in English from Ithaca College and an MPA from California State University, Hayward. Sgt. Matthew Price comes to SUSD PD with over 15 years of experience in Law Enforcement and Juvenile Probation. He was most recently a Senior Officer with the City of Escalon. Sgt. Price served as a Field Training Officer (FTO). Prior to Sgt. Price's time at Escalon PD he served as a Reserve Officer for City of Ceres and was a Probation Officer for the Stanislaus County Juvenile Probation Department. Sgt. Price holds a Bachelor's Degree in Criminal Justice. Sgt. 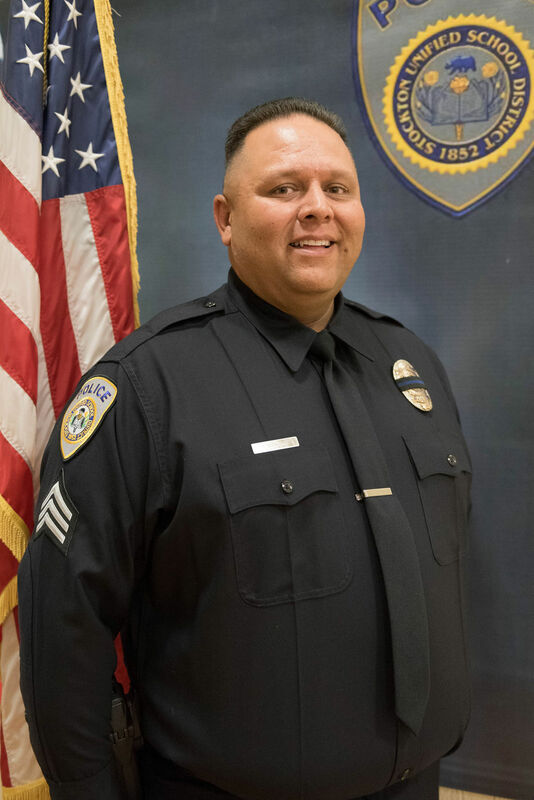 Marc Parker was hired with Stockton Unified Police Department in September of 2018. He began his law enforcement career as a Stockton Police Officer in 2002. He held various assignments during his 16-year career as an Officer such as; Community Police Officer, K-9 Handler, Detective in the Gang Violence Suppression Unit, Field Training Officer, Motor Enforcement Officer, Strategic Community Officer, Modified Vehicle Instructor, Emergency Vehicle Operations Instructor, Active Shooter Instructor, and Force Options Instructor (Simulator). Sgt. Parker is a long time Stockton resident and attended SUSD schools. He is a Stagg high school graduate, and as a student he was heavily involved in the Automotive Mechanics Program for all four years. He attended college and plans on finishing his degree in Criminal Justice. Regarding his personal life, Sgt. Parker is a small business owner which specializes in repairing and building custom exhaust systems for vintage muscle cars. He and his wife have four beautiful children. During the summer he enjoys boating on the Delta and barbecuing with his family. Marcus Omlin joined the SUSD as its first Emergency Services/School Safety Program and Crisis Team Coordinator in July 2013. Mr. Omlin has assisted in the implementation of several new school emergency procedures. Prior to coming to SUSD, Mr. Omlin spent 27 years in the fire service, working his way up to the rank of fire captain. During his tenure as a fire captain, he was responsible for mitigating multi-hazardous emergencies and assisted in development and implementation of the Fire Inspection Program. He has a strong working knowledge of the California Fire and Building Codes, conducting both School and Business inspections. He aslo has years of extensive experience with ICS and worked in the command center during the 1997 floods in San Joaquin County. Mr. Omlin is a state-certified Fire Officer, Instructor, and Fire Investigator, worked part time at Stanislaus State teaching CPR and first aid, and was a Lodi USD Drug Program Instructor. He lives locally and is married with four children. Chris Vaughns has been with Stockton Unified for over 16 years. 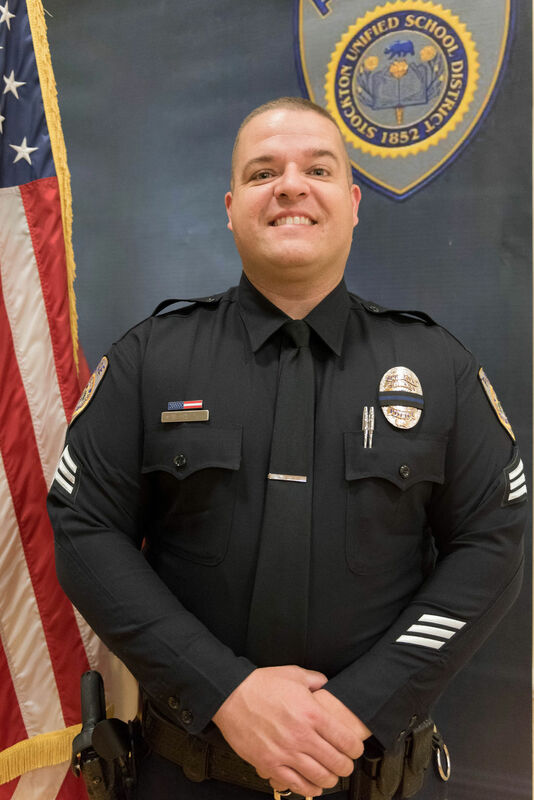 He has served SUSD in many capacities such as; Food Services, Custodial Services, Information Services, State & Federal Programs, Research and Accountability, Elementary Education, Curriculum and Instructional Technology, and recently joining the SUSD Police Department in 2018. Chris journey began when he relocated on his own to Stockton from Sacramento at the age of 18. He joined Stockton’s California Conservation Corps to not only get off the streets but learn job skills. He later went to Heald College and earned a Certificate in Computer Technology. His enjoyment for computers led him to San Joaquin Delta College where he received his Associate’s Degree in Computer Science. He then studied at Humphreys University and received his Bachelor’s Degree in Liberal Studies. In 2017, Chris received his Master of Science in Educational and Instructional Technology from National University. He graduated with distinction which earned him membership in Pi Lamda Theta’s honor society. As Chris worked and pursued his education, he was also a Foster Parent for five children within 10 years. Currently, Chris is pursuing his Crime Analyst Certification at Sacramento State University. Chris considers himself a “life-long learner” and is a strong believer of education, family, and community. He still resides in Stockton along with his wife and three children. Working in schools allows us to establish great rapport with students. Sometimes we are their mentors during difficult decisions in life, sometimes we are the ones they come to when they are afraid, and most importantly, we are there for them. Our Police Department is dedicated to providing the safetest campuses possible. We have School Resource Officers at each high school and additional officers which patrol surrounding areas at all times. We are committed to making all students feel safe. Our Police Department puts a strong emphasis on education. We work along side of schools to help establish career pathways which may lead to Law Enforcement Careers. Visit Public Safety Academy and Explorers Program on the menu for more information.